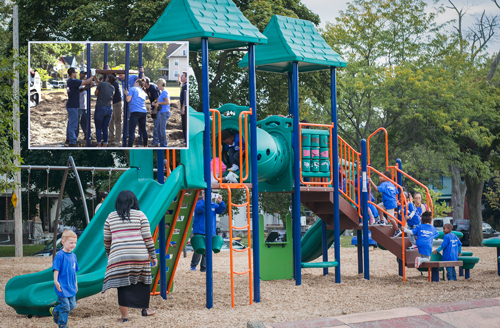 On Wednesday, September 13, Lake Michigan Credit Union, Grand Rapids Public Schools, the Grand Rapids Student Advancement Foundation, Carter’s Kids, and the Eastown community unveiled a brand new community playground at Sigsbee Park in Grand Rapids, MI. The old playground equipment had fallen into disrepair and was ruled unsafe by state officials. A funding drive, launched by LMCU’s lead donation put the wheels in motion to replace the old equipment. Following two days of post hole digging, prep, landscaping and assembly by volunteers, the playground was dedicated in a ceremony on September 13, to the delight of dozens of youngsters present. Many thanks go out to all who devoted their time, money and effort to bring the fun back to Sigsbee Park!